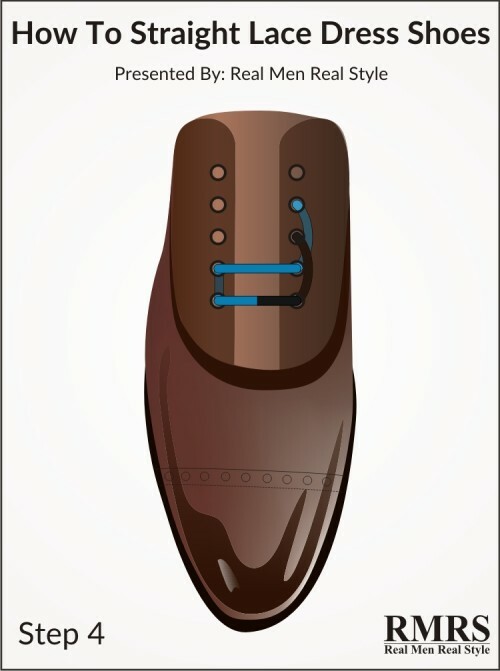 It is funny most men don't know how to properly lace their leather dress shoes. Why get a quality good looking leather dress shoes if your laces look bad? It just ruins the whole look. 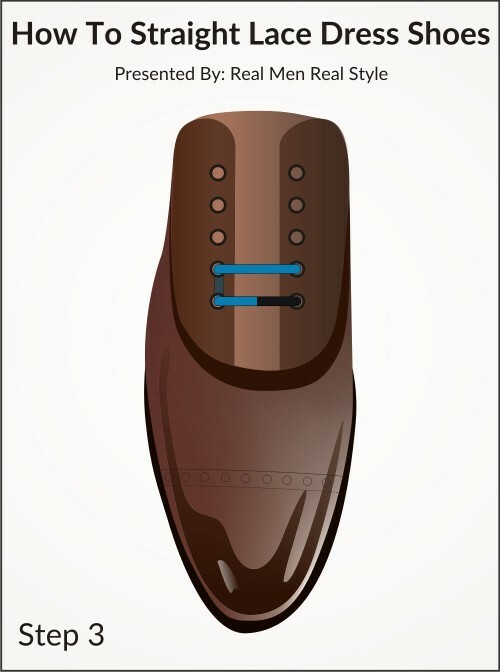 There are only two types of shoe laces you should use for your leather dress shoes. Please feel free to experiment with the colors! There are two main ways to lace your leather dress shoes. Due to its straight edge look. Pun fully intended. Completely unlace your shoes. Ensure both laces are of equal length. Begin straight across on the outside and in through the bottom holes. Pull both ends to ensure that they are even. After ensuring that that shoelaces ends are even, pull the laces taut. Now, you have your first bar. Adjust so that the left end is slightly longer than the right end. Then straight across on the outside to create the second bar. Bring it from the first eyelet to the third eyelet on the right side of the shoe. Pass the left end of the shoelace from the second eyelet to the fourth, also on the right side of the shoe. Both ends run straight up on the inside, each skipping one eyelet and emerging two eyelets higher up. Both ends of the shoelace continue straight across on the outside and in through the adjacent eyelets. Now, you have your third and fourth bars. Pass the right end of the lace (brown) from the third eyelet to the fifth. The left end of the lace (blue) runs diagonally across from the fourth eyelt on the left side to the fifth eyelet on the right side. 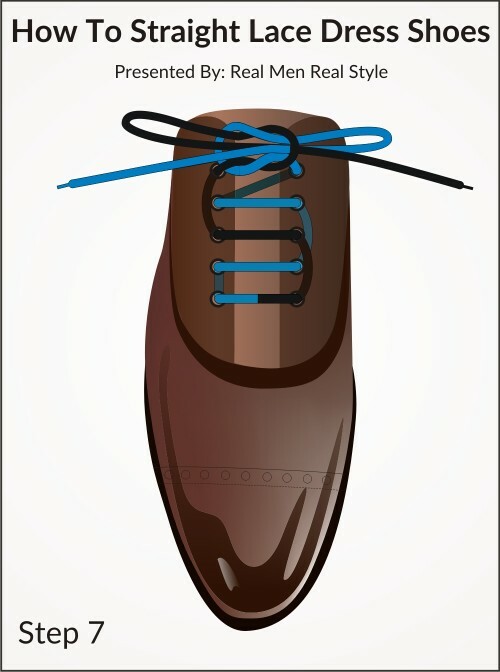 To finish off the lacing, ensure that your shoelaces are of an even length. They may require a slight adjustment to ensure that the ends meet when the laces are pulled tight. Now that you’re done, it’s time to tie your shoelaces together. While the blue meant the other side. When in doubt, just go straight lacing and round laces. You will never go wrong with them. Also, please experiment with colors! 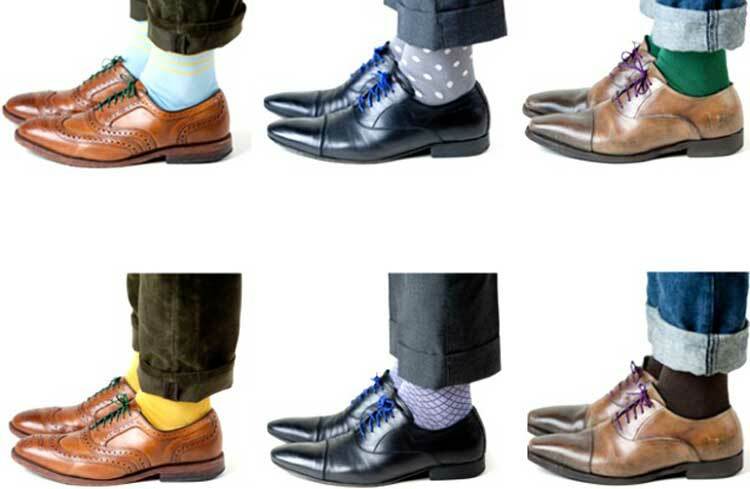 Go darker colors and more similar to your shoes to play it safe. Just useful content on shoes, being well dressed and updates on CustomMade stories!